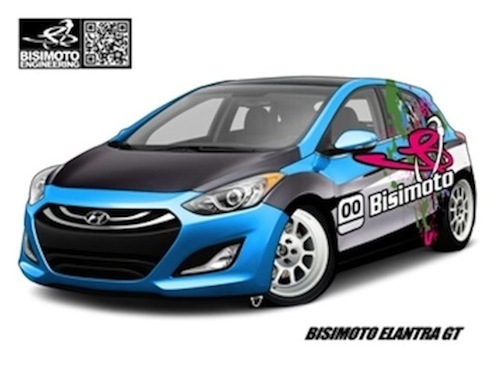 Hyundai has teamed up with Bisimoto Engineering to produce a totally outrageous Elantra GT with 600 horsepower for the 2012 SEMA Show. When you combine a progressive manufacturer like Hyundai, and partner with California-based tuner Bisimoto Engineering, you get a 600 horsepower Elantra GT concept. This is the Elantra GT’s first concept appearance at SEMA, and what an outrageous way to make its debut. Bisimoto has taken their high-performance technology and applied it to the Elantra GT and came up with some incredible performance gains. Bisimoto Engineering is known for their passion for taking overhead camshaft inline four-cylinder engines and flat-six Porsche powerplants and turning them into fire-breathing monsters. And Bisimoto applied their magic and left nothing untouched on the Hyundai Elantra GT. They started with the stock 1.8-liter four-cylinder engine rated at 148 horsepower and 131 pound-feet of torque. They took out the internals and added forged Arias pistons, Bisimoto con-rods and a Turbonetics turbocharger. They added AEM water-methanol injection and Bisimoto high-pressure injectors just to see how much horsepower the little four cylinder could produce. What they created, was one of the highest specific-output Hyundais ever created. The 600 horsepower Elantra GT is one incredible creation. The Elantra GT concept will also get some external goodies like ARK custom body kit to give it a European racing look. The one-off concept car will be shown at the 2012 SEMA Show along side a number of other Hyundai cars like the Veloster and Genesis Coupe. On the inside the cabin gets a custom interior that is designed to handle all that horsepower. It features a JFN full roll cage, Bisimoto racing seats and harnesses. It also comes with a Racepack IQ3 dash, AEM wideband failsafe module for protection, G&J braided lines and a special effect Rueda interior paint. The performance enthusiasts at Bisimoto Engineering certainly know how to deliver a premiere custom product to their customers. The Bisimoto Engineering Hyundai Elantra GT Concept is an engineering marvel that is sure to thrill those who attend the 2012 SEMA Show. This car will be a must-see and Hyundai couldn’t have said it better: “This concept is an assault on the senses.” Check it out under the Hyundai banner at the SEMA Show.